The names of Allah exceed a total of 99 in the Quran and Hadish. “Ya Hakeemu” is one of Allah’s 99 Names. The meaning of Asma ul Husna Ya Kaheemu is The Wise, He who has wisdom in all orders and actions. Reciting this name can give solace to our souls and guidance to our intellects. According to Islamic rules, a Muslim men kind may not be given any of the 99 names of Allah in exactly the same name of Allah Pak. For example, nobody may be named Al-Aziz (The Almighty), but may be named Aziz (almighty). This is because of the belief that Allah is almighty, and no human being is the equivalent of Allah Pak, and no human being will ever be the equivalent of Allah. Muslims are allowed to use the 99 names of Allah Pak for themselves but should not put ‘Al’ at the front of them. Who recite this name of Allah, Allah will open the doors of knowledge and wisdom for him. 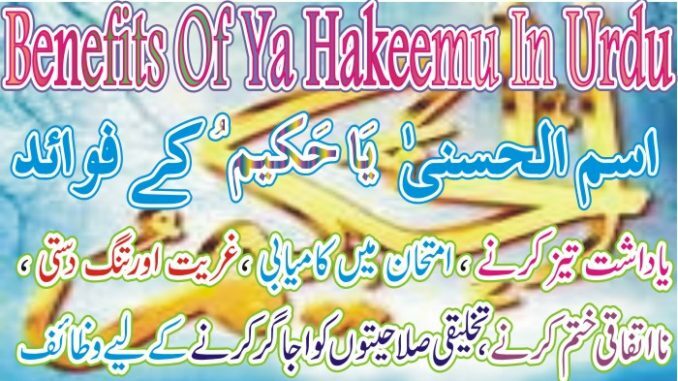 The person who recite “ Ya Hakeem” 80 times after each Namaz every day, will never become needy. Student who recite “ Ya Hakeemu” 78 times before going to bed for sleeping will get success in exam. Because this name of Allah have ability to increase your memory power. Recite Darood Sharif 3 time before and after reciting every wazifa.